The board of the Consortium of Higher Education LGBT Resource Professionals is heartbroken to learn of the passing of a dear colleague, friend, and member, Dr. Sheltreese ‘Treese’ D. McCoy. Her death means a profound loss to our profession and to the many students, faculty, staff, and colleagues who had an opportunity to know her. 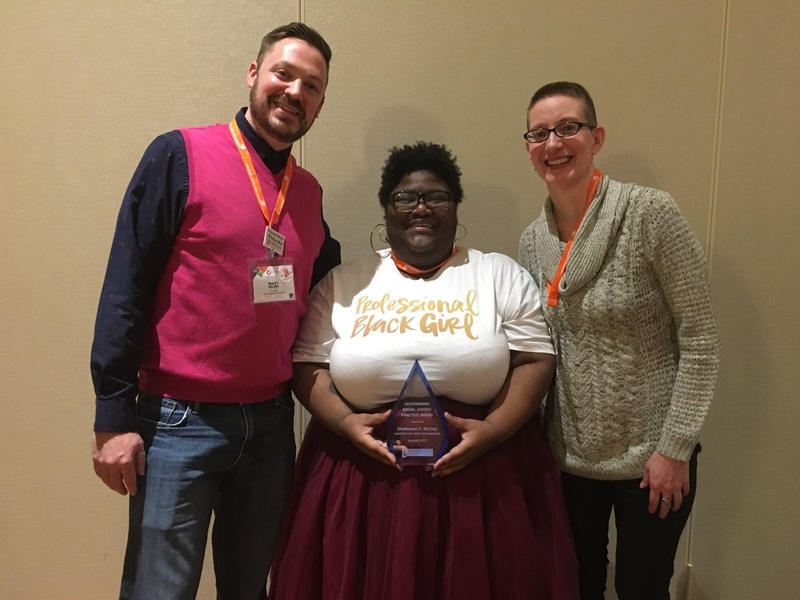 Treese committed her life's work to advancing and centering queer and trans people of color in higher education, specifically Black liberation within LGBTQ resource work. From 2012 to 2017 Treese developed and coordinated the Crossroads Initiative at the University of Wisconsin-Madison. The Crossroads Initiative is the first university-funded collaborative initiative between a Multicultural Student Center and a Gender and Sexuality Campus Center addressing the intersectional realities of students through programming, affinity spaces, education, individual support, mentorship, advocacy, and resource development centering QTPOC students. This groundbreaking initiative Treese spearheaded served as a national best practice in serving QTPOC students in higher education. In this role, Treese created the QPOC Resource Guide which highlights books, articles, movies, organizations, websites, and blogs that feature queer and trans people of color. This guide has been, and continues to be, distributed and used in our daily work in serving QTPOC in higher education, and many of us have drawn inspiration from this resource for our own programs and initiatives. She also used Crossroads as a platform to host the first statewide Wisconsin QTPOC conference in 2015. Dissertation: Where is my place? : Queer and transgender students of color experiences in cultural centers at a predominantly white university. Full text available at Worldcat. Contributions to Consortium: Mentorship and fellowship for and with queer and trans professionals of color; facilitation of many sessions and academy sessions at Creating Change including work on transformational relationships, pipeline, and QTPOC being pushed out of higher education and student affairs; key member in the development of the Consortium of Higher Education Resource Professionals’ Recommendations for Supporting Trans and Queer Students of Color (PDF). Consortium award: Treese was honored in 2017 with the Consortium Award for Outstanding Social Justice Practice for her work. See her award bio here (PDF). Please also support Sheltreese’s family in her homecoming by contributing to her family’s GoFundMe page. Treese drew inspiration from her own lived experiences and years of professional work supporting students. She led confidently, humbly, critically, and with a deep sense of care and love for the people around her. She truly saw and acknowledged people in their wholeness, specifically queer and trans students and professionals of color. For many QTPOC professionals in the Consortium, Treese and her work was a possibility model for us and helped many of us see that it is possible to do the work of serving and centering QTPOC voices unapologetically.